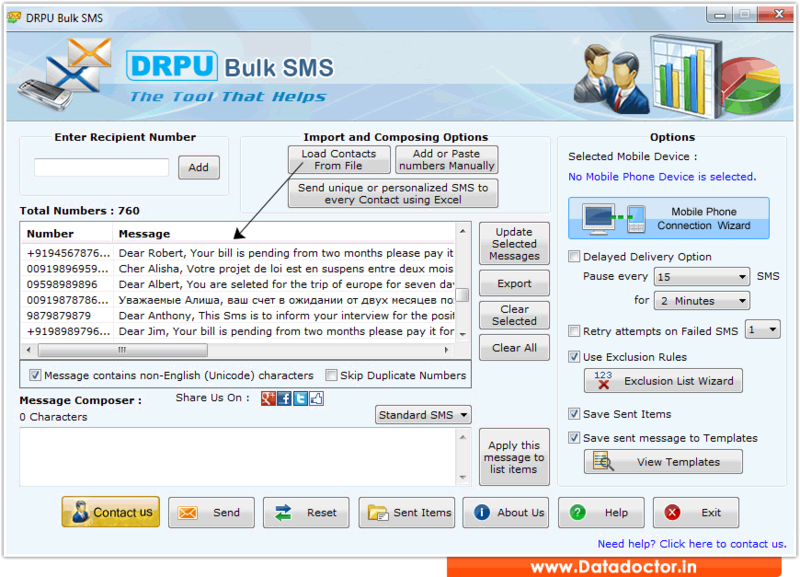 Bulk text messaging software sends group sms from your PC to any other cell phone while using any GSM mobile phone. Bulk sms tool used to send text sms to thousand of numbers to fulfill your business marketing and other useful needs. Group sms software is used to broadcast personalized sms to family members, friends, relatives, business sms, news alerts, job alerts, promotional campaigns, contacting employees, event alerts and notification, invitations, community sms etc. from your Laptop. ◉ Easy to use mobile marketing software. ◉ Improves customer service by sending voluminous sms instantly. ◉ Business SMS for building long-term relationship with customers and staff. » Capable of broadcasting thousands of text messages. » Import phone number list from Text file/Excel file format saved in PC. » Easy access to load recipient phone number. » Erase duplicate number entries from the list. » Economical other than using telephonic services to communicate with your clients. Note: Software can be easily installed on all major Windows OS including Windows 10/7/Vista/XP/Server editions 2000/2003/2008 and similar higher versions.